Ba Zhen Wan tonifies the blood following menses, surgery or radiation, or as a general tonic. The prescription nourishes blood by tonifying spleen Qi. A traditional herbal supplement that helps promote optimum well being and energy by establishing the body’s natural balance. Ba Zhen Wan tonifies the blood following menses, surgery or radiation, or as a general tonic. 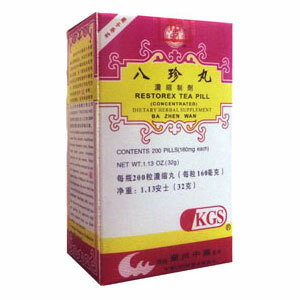 The prescription nourishes blood by tonifying spleen Qi. Use for deficiency of Qi and blood causing fatigue, dry hair and skin, pale complexion, cracked nails, dizziness, poor memory or concentration. Use for the menstrual disorders or amenorrhea, scanty or irregular periods or following heavy periods. Also, anemia, dizziness, heart palpitations, optic atrophy and slow healing of wounds when due to deficiency of Qi and blood. Use following childbirth, surgery, radiation and prolonged illness.